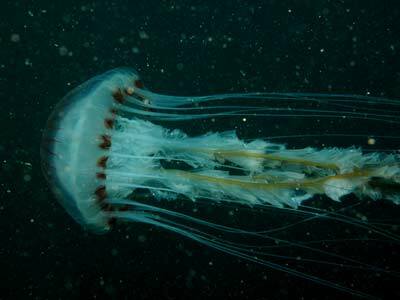 Description: The compass jellyfish has a series of V-shaped brown marks in a radial pattern on the disk. Picton, B.E. & Morrow, C.C. (2016). Chrysaora hysoscella (Linnaeus, 1766). [In] Encyclopedia of Marine Life of Britain and Ireland.